No matter which part of Atlanta you drive through it is common to come across well maintained entryways into neighborhoods. Often, the entrance to one particular homeowners’ association (HOA) is marked with a beautiful and intricate hardscaped sign that proudly announces the name of the subdivision. These elaborate community signs are beautifully landscaped and well lit at night. Our design team and installation crew at Hutcheson Horticultural Company is proud to have a part in many of these neighborhood entrances. 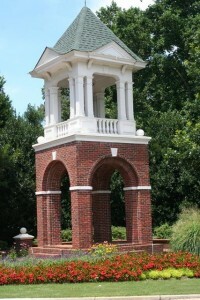 We are able to design hardscape association signs, waterfalls, and ornate floral arrangements according to the seasons. In the winter, we even work diligently to put a little sparkle into the holidays with holiday decorations. Not only do we create amazing custom designs, we also carry them out with precise installation. Our installation crew knows how to properly install hardscape material and landscape materials. Often times one compliments the other. In addition to making HOA entryways stunning upon design and install, we prolong the beauty season after season and year after year. Our maintenance crew takes care of the trimming, pruning, mowing, edging, and more! If you are searching for a landscaping company in Atlanta specializing in HOA work, then look no further. Take a look at our service spotlight for Legacy park and contact us for an estimate and consultation today.